In the 20th century, marketing was the pusher of a consumption addiction: Madison Ave's game was to create perceived value by "differentiating" the same razors, blades, and toothpaste. At the Lab, we've found that companies who create perceived value are significantly less profitable and more vulnerable than companies who are rethinking marketing to create real value. In a tumble of public statements and press releases Pepsico has stepped-up its response to the disappointment of last year's earnings. The messsage is clear: 2008 is now gone - say hello to 2009, with a brew-ha of new CSD graphics, stevia sweetened drinks, and cosmetic changes to Gatorade. I find the Gatorade changes to be the most interesting. After 40+ years of dominance in "sports", Vitamin Water through the Coke system is starting to impact Gatorade's dominance. Gatorade is a drink for athletes, but it also gets sizable consumption from consumers looking for non-sports refreshment. Vitamin Water is tapping this market with its promise of added Vitamin functionality. 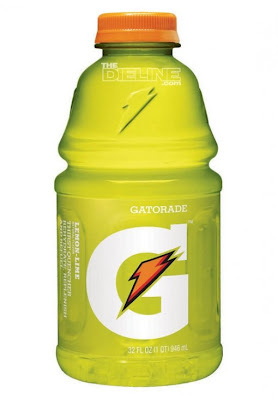 2) The neon colors of Gatorade make everyone think the beverage isn't that good for you. These two dynamics make Vitamin Water an attractive alternative. New more aggressive graphics, and rebranding of sublines like Gatorade Rain to Gatorade "No Excuses", and Gatorade AM to Gatorade "Shine On". More here. Are the new base graphics cool? Yes, very striking. Probably helps the core flavors - very true to the brand and the experience.